Need a password manager app for iPhone? We have a roundup of best password manager apps for iPhone and iPad. These password manager for iPhone apps can help you keep your password secure at the same time make your life easier. There is no inbuilt iPhone password manager support for third party apps and therefore these apps are even more important. 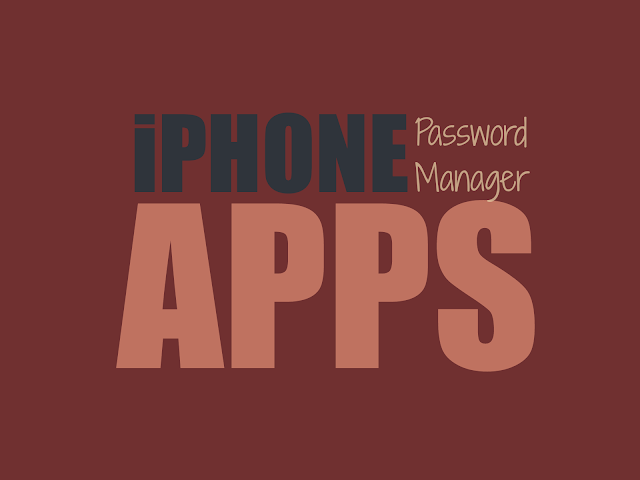 Ideal definition of The Best iPhone password manager is to be secure, simple and must work with all types of apps. Not every app may be a able to solve all needs however it may be able to reduce the pain to a large extent. An iPhone password manager is a service that helps you to create passwords that are strong, ensures that they are kept secured and allows you to use them whenever you need to do so. It helps you to track your password and other personal info that you use in the web. Many of the password managers allows a user to automatically log in to the websites. A good password manager can protect valuable information such as credit card information, bank account details and other important details. Furthermore, a good password manager acts as a secure safe to lock away the user’s valuable information like credit card numbers, PIN codes, bank account number and much more. Dashlane is the best password manager for iPhone, iPad and other devices and it comes free of cost. It helps to keep track of the personal info and password that you use on the net. You can generate strong passwords with the help of Dashlane. This is one of the best password manager for iPhone. iPassword is a password manager for your iPhone that can store your important information in a secure manner and enables you to do an auto log into sites using a single tap. The user does not need to remember usernames, addresses of websites and passwords. Keeper is a password manager that manages your important information such as private information and password so that you don’t have to remember them while logging in. It protects your private files by storing them securely. It is a free password manager for iPhone and iPad. It is an app used for password protection and protects other sensitive information such as bank account, Apple ID, credit card details and any other valuable information. It uses an advanced technology to protect your data as well. iPassSafe is a free password manager that provides high security of your data and is equipped with intelligent human interface management system. It allows you to login to your sites or your bank account with one click and manages multiple databases that are password protected, it imports the contact details from iPhone’s address book too. This password manager helps you if you have too many passwords and accounts to remember and is perfect for iPhone5 as well as iPad. It comes with a standard iOS interface design. It is integrated with the web browser and helps in auto filling your account and password details as well. This password manager has won awards for its features and has an auto form filler with a single click logins. It allows auto saving of your login information for the new online login forms. It works with iPhone, iPod and iPad. It also provides other useful features like manual logoff and auto log off. It is a flexible digital wallet that is available on the appStore. It has features such as enforced encryption, unlimited groups, customized input forms, unlimited groups and a user friendly User Interface. It has a free backup facility for both the PC and Mac. This password manager helps in creating unique and strong passwords for every website and remembers all those passwords for you and helps you to log in the web with a single tap. It is a generator for strong passwords and secures your data by encrypting them using secured 256-bit encryption. PassWordBox is an award winning free password manager app that helps the users to store, share and retrieve passwords and other private information anywhere, anytime, on any type of device. It saves your time by logging into websites with one tap. Additionally, it provides encryption of your password with AES-256. mSecure is a password manager utility that uses secured 256 bit encryption code to keep your valuable personal information such as username, account numbers and passwords safe. It has features of auto-locking the app and has a powerful Password Generator to create un-guessable and strong passwords. oneSafe has features of providing high security like decoy safe, auto-lock, intrusion detection, double protection for personal data and double protection for your data. It works like a secured safe for your PIN codes, documents, credit card numbers, passwords, photos, bank account details and much more. It provides easy to use, straightforward and a safe storage for all your important documents and other valuable data such as login information, passwords, images, photos or screenshots along your other private information. It is simple to use and uses 256 bit AES encryption for data security. It is an award winning premium password manager, but a user can sign up a free trial for two weeks by downloading it. It saves your password and you can have a secure access from any mobile device or computer. With this utility, you need to remember a single password which is your last master password for LastPass. The password manager acts as a bank vault and protects your valuable personal information in an advanced secure AES-256 encryption data format. It also facilitates synchronized secured info across devices using the Dropbox or iCloud technology; hence your password is available to you whenever and wherever you require it. It is high time that you secure valuable information on your Apple device using a good Password Manager that provides the best of security features and acts as a bank vault by storing your confidential information in all popular devices. Thus, it saves you the headache of remembering all your passwords by replacing them with a single strong and un-guessable password.